Basket with Roll Top Lid. 53cm X 32cm X 18cm..
Clear Breakfast Drink Dispenser 5 litre (175o.. 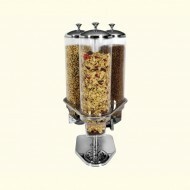 Triple Cereal Dispenser 3 x 4 litre (140oz).. Cool Serve Unit Chilled using cool packs in b.. Heavy Duty 2-piece Basket and Chrome Plated S..
Naturals Wooden Bed Tray 48cm X 31cm X 5cm..
Naturals Wooden Tray 40cm X 30cm X 4cm..